Marilyn Stemp is a frequent contributor to MPN and is the editor of Iron Trader News online. Marilyn also does work for Sturgis Rider Daily during the Sturgis Rally. When she’s not promoting and inventorying the world’s largest Evel Knievel collection she rides a mid-‘90s Sportster and is restoring a 1954 Flathead. Consumer events are for consumers, right? Regular riders go to rallies to ride great roads and have fun with likeminded people. But consumer events, the major ones and smaller ones alike, offer a window on the motorcycle industry for people in the business, whether dealer, distributor or custom shop. If you’re dismissing such happenings as insignificant, you may be missing out. The science of observation can teach a person plenty, but you have to be on the scene to gauge the traffic, count the bikes and evaluate the energy. It’s not something you can do remotely or digitally — at least not effectively. At Daytona Bike Week this year, and every year, industry professionals were visiting the venues, taking in the races and walking down Main Street in Daytona Beach, FL, from March 8 through 17. 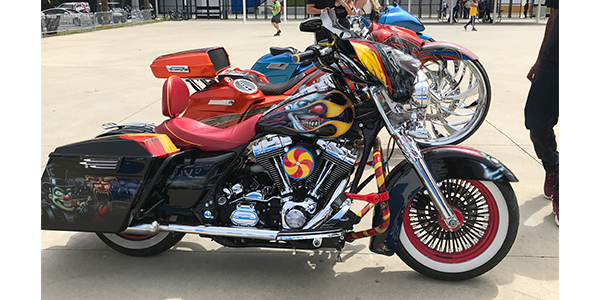 If you haven’t been to Bike Week lately, know that Main Street is still the center of activity, but Rossmeyer’s Daytona Harley-Davidson is a major spot for entertainment and aftermarket parts vendors all week, along with the Daytona International Speedway. They’re the two major vending areas for recognized brands. Beach Street, formerly a mash up of vendor activity, was all grass and palm trees along the river this year, quite a change from past years. The Indian dealership held Slingshot demos and the famous Rat’s Hole Show, but it was a shadow of its former self. OEMs gathered in front of the Speedway where demo rides were a significant draw and there’s a slew of other aftermarket brands. Harley-Davidson’s footprint here was substantially smaller than previous, but their demo lines were respectable. Indian kept a steady pace with their test rides, too, but Vanderhall in particular kept up a buzz, running a constant line. Craig Glab, eastern region sales manager for Hard Drive/Western Power Sports, wasn’t at the Speedway or Rossmeyer’s. He finds value in the grassroots shows that surround the larger draws. He said his goals at consumer events are multi-layered. “At many shows, like the Donnie Smith Show, we’re supporting our dealer network. WPS doesn’t sell direct to the consumer, so we go to shows to educate the consumer, then they can go to their local dealers and ask for products by name.” Glab makes special effort to have a presence at shows like Mama Tried, Boogie East and Willie’s Tropical Tattoo in Ormond Beach near Daytona, where I caught up with him. Charlie Hadayia Jr., Tucker’s VP of purchasing and merchandising, doesn’t skip the big rallies either. Hadayia’s job is to oversee merchandise, so it’s vital he observe and evaluate what riders are interested in. Being in Daytona helps him get a bead on that. “Think back 15-20 years ago, an event like Daytona was all Harleys. But times have changed,” he said. 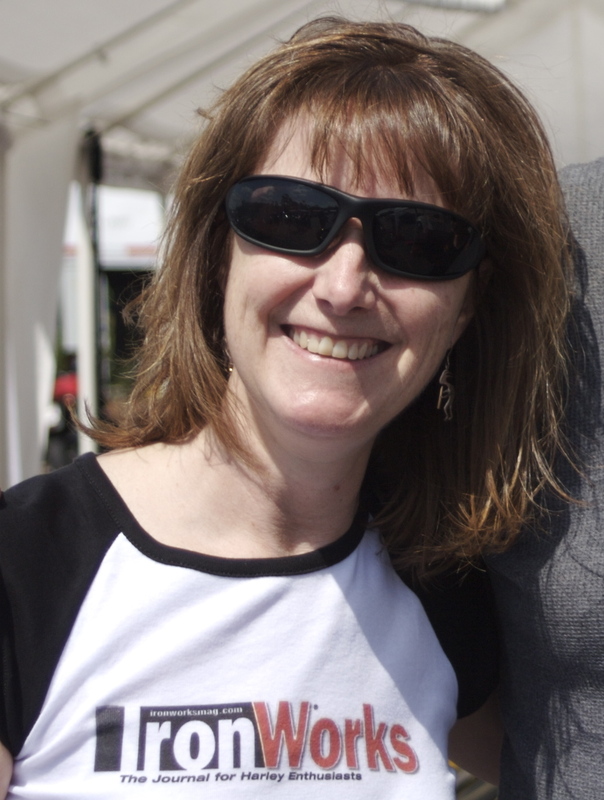 During Bike Week, Hadayia went to bike shows, Rossmeyer’s H-D, the AFT race and the speedway. Cruising the vendor aisles at Rossmeyer’s H-D, I ran into Jim Matchette, national sales manager for Drag Specialties and Tom Motzko, head of vendor development for Drag — and it was no surprise. A Drag Specialties big rig has been part of the vendor area there every year in recent memory. Why? For several reasons. “It’s a way we support our dealers,” Motzko said. “It’s where our customers are,” Matchette added. For Lemans Corporation’s Parts Unlimited and Drag Specialties, a rally like Daytona is important enough to “support the sport with a series of events,” according to a press release sent in advance. Supporting their brick-and-mortar dealers has been a solid mantra for Drag and Parts, and it was especially important in Daytona this year, as Rossmeyer’s celebrated their 25th anniversary. Add in the appearance of many brands represented in the company catalogs, along with the need to keep a finger on the pulse, and it’s all but a necessity to be present. As Motzko also explained, Lemans has a history of strong support for race teams. Drag is currently backing American Flat Track Singles rider Dawson Schieffer with Black Hills Harley-Davidson. “New York Myke” Shelby, owner of San Diego Harley-Davidson and a life-long rider, rides to Daytona from SoCal every year like clockwork. You can’t place a value on the potential for serendipity – that happenstance meeting just could have unexpected consequences. If you love motorcycling enough to make it your life’s work, keeping track of the current vibe is necessary but it can also be fun. You just have to be there.